What better way to show that even kids can easily make electrical connections with Apex technology than by a toy demonstration? Our connector technology has been built into the edges of these plastic tiles. When power is applied to a tile, LEDs light up to show that an electrical connection has been made. Get these edge connectors in proximity and magnetic forces provide a negative insertion force that positively aligns and maintains the electrical connection. This video shows the ease of making electrical connections with FMI connectors and their ability to maintain connections under vibration and intentional misalignment. It is not necessary to have exacting tolerances on parts—even when these connectors are built into the outer surface of your product. The LED tiles shown above have square edges, but electrical continuity is maintained while an assembly is disturbed. The amount of mechanical attachment force is a design variable. Since the electrical connections are maintained with the misalignments illustrated above, then obviously parts tolerances, thermal expansion and vibration can be accommodated. This mechanical tolerance robustness exists in three dimensions. Depending upon the design objective, one or both elements of a contact pair can be designed to provide compensation for mechanical mismatch. For example, the cable and the magnetic light pucks in the video below both contribute mechanical flexibility to ensure solid electrical connections. Spacers loosely position the cables relative to one another. In other applications, one side of the connection may be fixed in position with variable spacing and local planarity, but the other side compensates. 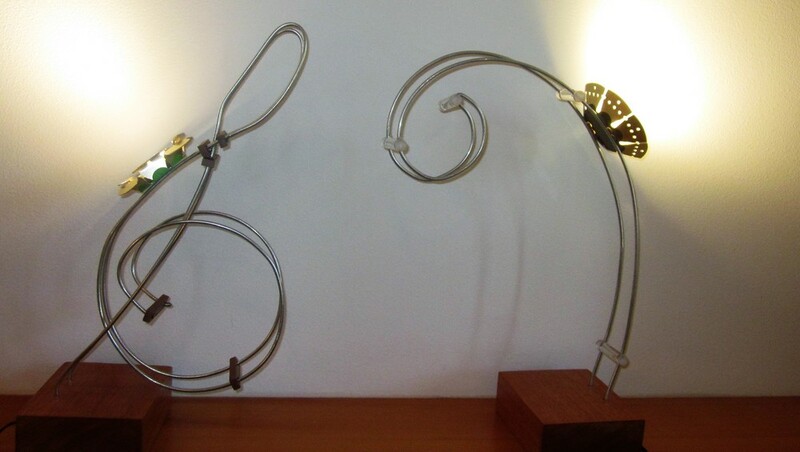 For example, the treble and bass musical clef desk lamps shown below were fabricated by hand using simple wood forms. The shapes and sizes of each pair of electrodes are not identical, nor is their spacing uniform along the curves. Even so, the magnetic lighting pucks can be attached and moved to a number of positions along the surfaces. Other examples of assemblies of rigid and formable electrodes are shown. For low-voltage lighting applications, this shows how orienting the direction of light output is easily changed by bending the electrodes and/or moving a magnetic puck to a new location. The range of electrode configurations compatible with the same puck is another indication of mechanical robustness.And the patented axially interleaved electrode rails provide up to complete 360 degree revolution and translation with both magnetic and non-magnetic pucks. For more information on lighting modules, please jump to the Solid State Lighting page. Since, there’s no need to provide recesses or projections for proper mating of the electrical connection, there aren’t restrictions on the direction of approach of parts from the electrical connector. The video above shows how tiles with curved edges that are connected into a planar array can also be removed or added in a perpendicular direction. Unlike electrical connectors with pins and sockets, there is no need to disassemble the array to add or remove a central piece. As a result of the assembly and disassembly directional freedom above, once connected, there is freedom to slide parts relative to one another while maintaining the electrical connection. The cubes below have bulls-eye contacts built into faces that allow rotation while maintaining electrical contact. Of course, rotary and linear motion can be used to provide sliding contacts that maintain electrical continuity or electrical switching capability without paying for a separate switch assembly by moving contacts out of relative position. For medical applications, these smooth contact surfaces can also be readily cleaned with liquid sanitizing agents. Sealing of individual contact assembly halves or mated pairs and integral switching capability to prevent short circuiting is achievable with this technology. The cubes above each contain only one magnet that two electrical connections to an adjacent cube face that does not contain a magnet. The highest number of contact pairs using a single magnet we’ve tested is 85 within a one-inch square array. The contact force uniformity measured between the center and the edges was +/- 7%. Product requirements will influence the optimum choice of electrical contacts per magnet. Unlike other array connectors that require high insertion force for uniform contact force, there is no requirement on symmetrical layout or rigid housing structures to maintain reliable connections. Conventional connectors need a dedicated connector housing to hold the electrical contacts in place. Why pay for a separate connector housing when your product already has some form of housing that can be used as the connector housing with the Apex technology? The LED tile and LED block demonstrations show how the electrical connectors are built into the existing housing of the product. To show that thinner profiles are feasible, a phone was modified to incorporate connectors directly in the existing molded covers by tapping internally to the electrical lines going to the conventional Micro-USB connector. Charging and syncing to a separate docking station and a cable with our connector technology was demonstrated. Since there are no pogo pins necessary with our technology, the planar structure of the contacts through the phone case can be readily sealed to prevent moisture or contaminants from getting inside. Note that these connectors don’t even have to be built into a stiff plastic housing. It can be another substrate or other mechanical element you already need for your product. The LED pucks with integral heat sinks shown on the SSL Lighting page use the heat sink as a portion of the housing. The LED pucks with a thermal interface for external heat sinking shown there use conventional FR4 printed circuit boards as the substrate and the outer copper layer for the contact pads. Even flexible foams and rubber membranes can be used with our technology as the connector "housing". Since there are no pins to orient relative to a socket, blind connections with relatively loose tolerances are possible. Below is a photo of an interposer connector assembly that allows an Apple iPad to reliably mate to the inside of a protective case that includes additional electronics. Only the rear part of the case is shown to illustrate the sliding fit without tight tolerances or insertion force. The case with iPad inside can mate with a magnetic docking station for external signal communication and charging. We've demonstrated the same capability for a separate mobile phone case for connection to a docking station or a magnetic break away sync/charging cable. As mentioned above, we've also used the rear case of a mobile phone to build in our magnetic connectors to directly interface the data and charging lines without a separate micro-USB interposer connector. Although these examples use rigid cases, our connector technology can also be built into soft, flexible cases just as easily. Want to have access to electrical power at different points on a surface, but don’t like the idea of having exposed voltages on unused connection points? We’ve got that covered too. Below is a surface with pairs of exposed contacts. No voltage is present at unused contacts. Voltage is only present at the top surface when the LED hotel module is present in this adaptation. This vintage Parker Brothers Monopoly game board was modified to transfer electrical power through the board from the bottom, but only when a hotel is present. Similar functionality is possible by incorporating an overlay on the top of the board. For the eight times higher hotel charge for Boardwalk compare to Mediterranean Avenue, wouldn't you expect a fancier hotel? But this capability isn't just for fun and games. Smooth, sealed surfaces are preferred in medical applications for sanitation. With this technology, you can have a smooth, sealed surface built into an instrument or a wall panel to connect probes or lighting that can be readily cleaned. Sterilizing liquids sprayed or wiped across the panel could bridge the exposed contacts without concern of having voltage present on the exposed contacts. But whenever an electrical connection is desired, power and signals behind the surface could be accessed by an electronic device cable as simply as the hotels were placed on the Monopoly board above. Similarly, exposed contacts on a medical implant, a wearable device, a cell phone or other portable electronic device could be immersed in water without shorting since the exposed contacts remain electrically isolated when not connected. Since the amount of magnetic holding force in the connector is easily designed, adding a gasket to seal a mated connection on a flat surface for additional water resistance is straightforward. The main purpose of the examples above is to demonstrate some of the capabilities of our patented, patent-pending and trade secret technologies. If you have a question about how anything described above could be exploited with your product plans, please contact us to start a dialogue.